We were plowing through the agenda at a sales meeting a couple of days ago when one of my associates offered to share some wines that he was presenting to a customer later in the day. They were from Fiefs Vendéens, a small AOVDQS in France’s Loire Valley south of Nantes, the production area famous for Muscadet. I have always been a big fan of the wines of the Loire Valley. The variety, quality and value are incredible. You’ll find delicious whites, reds, rosés, sparklers, sweet, dry—they’re all produced there. And although many common grapes are used in this region (sauvignon blanc, pinot noir, chardonnay, etc. ), several other less common ones are also well employed, including some of my favorites: chenin blanc, cabernet franc and melon de bourgogne. 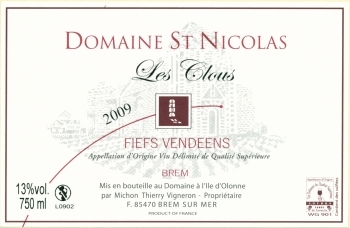 The Fiefs Vendéens appellation was created in 1984 and comprises four sub-zones named after their respective villages: Brem, Mareuil, Pissotte and Vix. The main grapes are chenin blanc, sauvignon blanc, chardonnay, gamay and pinot noir. The maritime climate (the Atlantic Ocean is nearby) helps keep the wines well-structured (nice acidity), with restrained alcohol, and subtle fruit. ~ by Thomas on October 3, 2010.